As each person has their own thoughts and desires, people fill their lives with different colors from cradle to grave. Among the many ways to express our thoughts, art is one of the most accessible. 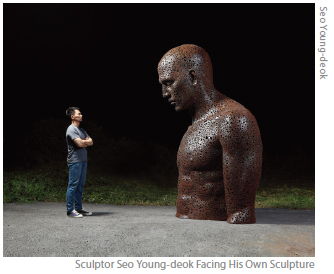 The UOS Times recently interviewed an alumnus sculptor Seo Young-deok (Dept. of Environmental Sculpture, ’03), one who expresses ideas through the arts. He is now working in Guri city, Gyeonggi-do and has held more than a dozen exhibitions with works crafted from metallic material. In our interview, Seo discussed his choice to become a sculptor and reflected on the meaning of his work. UOS : Can you tell me the reason why you chose sculpture among the many types of art? Seo : Since the time I was an infant, I have loved making things. Also, I liked more to deal with three-dimensional works than making things on a flat surface. UOS : What does sculpture mean to you? Seo : For me, sculpture is a means of expression and a way to live my life. As writers consider writing a form of expression, sculpture is the same to me. UOS : In most of your exhibitions, the reporters were able to see that you have made works with metal engraving. Why did you choose to use metal? Also, what is the difference between metal and other materials? Seo : I was attracted to the properties of iron. However strong and hard iron is, it melts when it is next to the fire. It maintains its form longer than other materials, and it is easy to get the desired shape through welding. This makes iron most attractive. UOS : Most of your works seem to represent people with dark feelings. What do the sculptures mean? Seo : I wanted to break the prejudice that an art should always be bright and beautiful. Human beings are not always beautiful. I wanted to show people a dark and depressed side of humans, which is not easily seen in everyday lives. UOS : Could you tell us about the difficulties you have working as a sculptor? Also, what helps you to overcome these hardships? Seo : Not only sculptors but also all artists will say that the hardest time of our lives is when audiences do not show any interest in their works. I also had a hard time when no one allowed me to exhibit. On such occasions, I considered quitting my job, and just thinking about it stressed me. There is no special way to overcome this hardship. I just try to change my surrounding environment or refresh myself in these situations, so that I don’t forget my first intention to become an artist. UOS : I wonder how much time it takes to complete a piece of work. Seo : It depends on the size and shape of the work. It usually takes about a month to make a work which is about 170cm tall. I also have worked for about three months on a large one. UOS : What do you want to deliver to people through your works? Seo : Rather than delivering something, I want to make people think of other things in today’s busy life. Contemporary men do not have time to appreciate sculpture because they are locked in society’s system, which requires them to work quickly. If they look at my sculptures and become absorbed in other thoughts for just a while, the results of my work will be satisfactory. UOS : Do you have anything to say to younger generations studying in your department? Seo : For an artist, there is no retirement. We can work until our death. With this in mind, I hope you have self-respect and enjoy this difficult work. The worries that you have now will help you a lot to prevail through life’s difficulties. The answers to each question were not that long, but The UOS Times was able to feel his sincerity in every sentence. As art comes out of expressing our own thoughts, every one of us can be an artist. If you want to have a rest from a busy life, visiting sculptor Seo Young-deok’s exhibition will be a good choice. Perhaps you will find yourselves in the arts.